This class will cover the ins and outs of finding and partnering with a literary agent for attaining your publishing goals. We will cover things like how to prepare your manuscript and write a query letter that sings, what to expect from your author-agent relationship, agency best practices and questions to ask potential agents, how to research they industry to find a great match, and finally, how to handle those pesky pass letters and what to expect from the positive response letters and interest in your work! In the publishing industry today, having a literary platform to shape your writer career is essential to continued success. We will discuss various ways to build and improve one’s platform from publishing in literary journals or writing for online publications, building a following on social media, to collaborating with your community near and far to create compelling content that will help you share your work with a broad audience. Class participants will shape and format a chosen short work for submission to journals or prizes, as well as create a realistic plan for the coming months in which to practically and actively grow one’s platform as a writer. A piece of writing is more compelling when the reader can sense what is at stake. In this class, we will explore how we can clarify the risks, desires, ambitions, and investments of our characters, speakers, speakers and narrators. We will examine the central, driving force of a piece of writing and learn to identify what is at stake based on four spheres: the personal, the professional, the social, and the political. This is a multi-genre workshop, applicable to poetry, nonfiction, fiction, and drama. Plato argues that human behavior flows from three main sources: desire, emotion, and knowledge. And before staging Kalidasa’s The Recognition of Śākuntalā, the director challenges his actress-lover: “As though in a painting, the entire audience has had their emotion colored through your melody. So now—what shall we perform to sustain the mood?” In this class, we will explore how creating vivid emotional worlds between characters and within storylines can build suspense, sustain drama, and lure the reader deeper in. Whether you’re currently working on a short story, novel, screenplay, theatrical play, lyrical essay, memoir, or narrative poem this class will help you craft a unique emotional landscape. 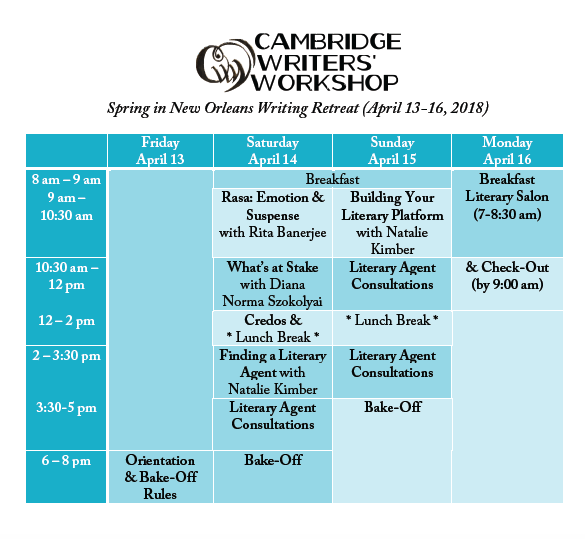 Inspired by Dipika Guha’s bake-off at last year’s NOLA retreat, we will do a multi-genre bake-off. A bake-off is traditionally a playwriting exercise or writerly dare popularized by Pulitzer Prize winning playwright Paula Vogel, . The dare will be launched at the beginning of the retreat, and writers will be given a set of parameters, shared elements, and a fixed span of time to complete a piece of writing. We will unpack a writerly toolbox and look at devices, forms and structures available for our use.